Join the discussion on our forums! 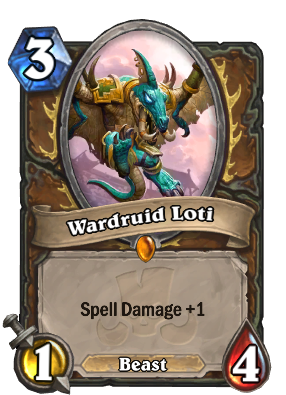 Come discuss Wardruid Loti over in our dedicated Wardruid Loti discussion topic. Ok, I've played with her a lot, and I think shes pretty good. Not top ten in Rastakhan, but close. Shes never the card that wins you the game, but shes never really a bad play either. To balance this, shes only playable in decks that don't rely on resummoning/cheating out beasts. Great design imo. One of my favorite legendaries from this expansion. If they had added one health to each form, it would have been a good Broken card. 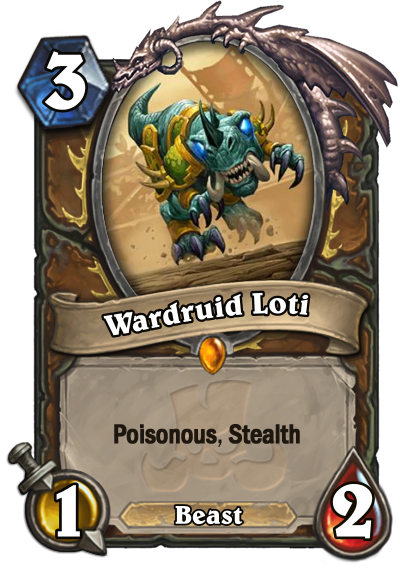 Come on druid already have enough versatility, making another Super good legendary that can go on any druid deck would be so unhealthy for the game. And btw this is by no means a bad card, this much flexibility with the only downside being a "vanilla body" is ridiculous. This will most likely be played in any druid deck without oaken summons. It's not supposed to be a win condition, it's three techs in one card. It won't be played by anyone, until players start using random decks without building a win condition. 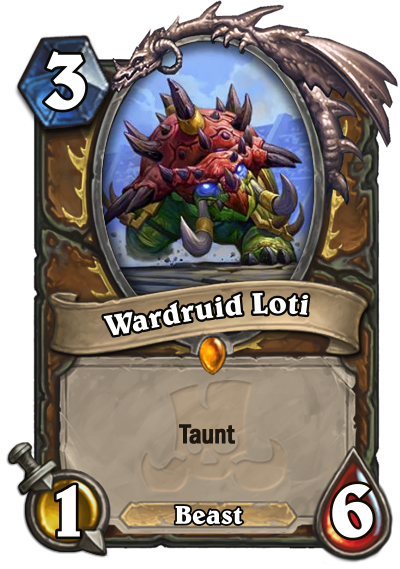 This is useless and a beast, so useless also in taunt druid. You make it sound as if you can't use any minion which itself isn't a win condition. This is clearly a support card. 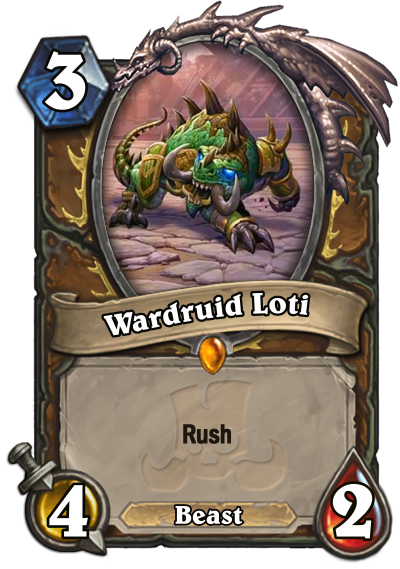 As people have mentioned, it being 3 cost and being a beast in it's forms cuts it out of most decks cuz it has anti-synergy with the most popular druid shenanigans. 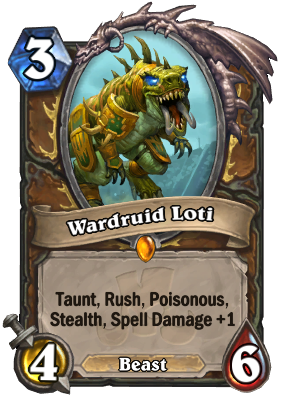 I put it in my token druid though, because it can be 4 damage removal, it can make my swipe a better clear, it can sack a bunch of dudes against odd paladin, or it can dissuade a turn 3 mountain giant. Yes, those are the good scenarios, but what other card is flexible enough to work in 4 types of scenarios for once card slot? I'm curious to see whether it'll see more wide-spread adoption after rotation. All in all, cool flavor and good balance. When can I get the golden image of Loti and zul'jin? Well I don't like this card but I opened it, now I only need Gonk, the Raptor and then I'm gunning for legend with Odd Druid. alright, purely based on the fact that she can be anything you could possible need at the moment she's good enough to be run, although she has no direct synergy with anything currently existing. Swiss Knife of the Woods. Flexible but not overpowered. 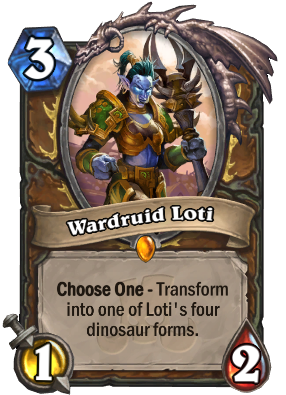 About time Druid get normal cards. I like it. Probably a slot in Spiteful Druid if the archetype is still around. This is the COOLEST CARD I'VE EVER SEEN! It's "Choose One", not Discover. So you should get all four options each time. Similar to how Kalimos works when you have an elemental chain going.